DNR Director Stephen McDaniel and Gov. Jim Justice announce an $11 million investment at Pipestem in 2019. 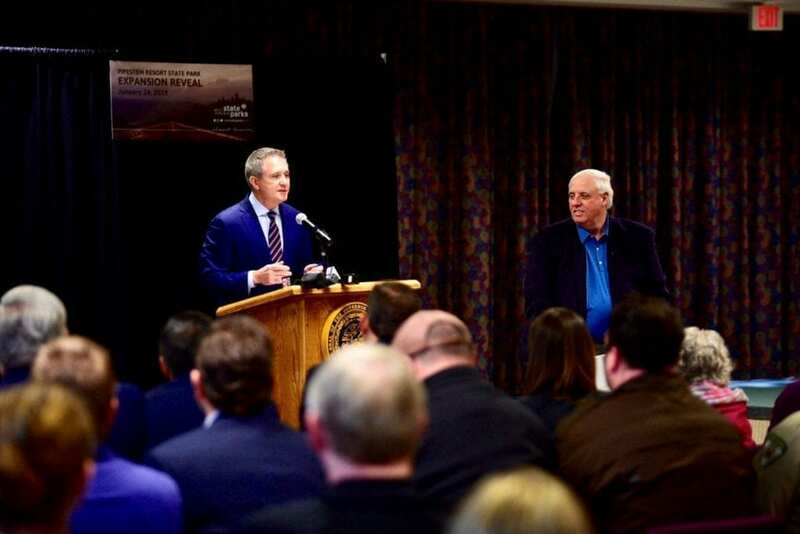 Governor Jim Justice today announced an $11-million investment package for Pipestem Resort State Park that will include new outdoor-adventure infrastructure and updated park accommodations. Beginning this spring, visitors to Pipestem, in southern West Virginia, will be able to enjoy a new splash park, lake adventures, guided trout-fishing trips, stand-up paddleboard tours, rock climbing and rappelling instruction, guided mountain bike excursions, and tubing and whitewater kayaking adventures. The West Virginia State Parks system and ACE Adventure Resort have partnered to provide these high-adventure activities at the park. “West Virginia is truly remarkable in every way. It’s got four of the most beautiful seasons on the planet. Today’s announcement was just one more step in making West Virginia a world-class tourism destination,” Justice said. The highlight of the additions will be the opportunity to ride one of the most extensive zip-line systems in the East when a new canopy tour adventure opens in April. The zip line will feature nine zips, offer breathtaking views of the Bluestone River Gorge and bring new visitors to Pipestem, one of southern West Virginia’s top tourist attractions. Bonsai Design of Grand Junction, Colorado, a world-class zip-line course builder, was awarded the zipline contract. The zip-line construction is just one part of the $11 million-dollar investment at Pipestem Resort State Park. Cabin modernizations, campground upgrades, water and wastewater plant replacement, and tram renovations are also forthcoming for 2019. “We’ve been trying to put this together for several years and it’s finally coming to fruition,” said Stephen McDaniel, director of the West Virginia Division of Natural Resources, which oversees the state parks system. “This is truly a cooperative effort between DNR and ACE Adventure Resort and we look forward to the additional recreation this partnership will bring to Pipestem and the surrounding area. We believe that the zip lines, as well as whitewater adventure tours, tubing, additional mountain biking opportunities, and the other new activities, will help draw and retain visitors to Pipestem Resort. “ACE is excited to partner with Pipestem to provide guided adventure activities to guests staying at the resort, including the zip line,” said Paul Buechler, chief financial officer of ACE Adventure Resort, which has extensive experience with its own zip line canopy tour in the New River Gorge. Over the next few months, park staff will work with ACE to provide different packages for the zip line and other outdoor adventures, including overnight accommodations. Pipestem has modernized its cabins for new and returning guests to have the best stay possible. More information will be available soon at www.wvstateparks.com.